When I first started Peter’s Useful Crap (this site), I wanted it to look like Plain 1.0, which was a nice CSS template but not yet a WordPress theme (and has since been removed from the site of the creator — Jay). Unfortunately, knowing little about WordPress or about CSS, my attempted hack didn’t turn out so well (I mean, look at the mess that is theblog.ca). Plainly is not an exact port of Plain 1.0 and has a few modifications, of course. I used the WordPress Default Kubrick theme (the one that is displayed when you first install WordPress) as a base and included a few of my own design tweaks (like the way code snippets are displayed when you use the <pre> tag… which I stole from eZ Systems). Download the Plainly theme [December 19th, 2007]. Simply extract the zip file into the wp-content/themes/ directory, then activate it as you normally would in the WordPress admin panel (under the Presentation menu). Hi Peter. I just recieved your recomendation to update to Plainly 1.0.1. in order to fix the archives pages. It just works. Thanks a lot! Love this simple theme. I was wondering however how to modify it so that the archive with the date does not show up? Hi! To do that, you'll have to edit the sidebar for the theme. 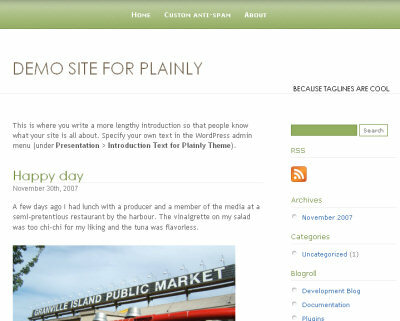 Greetings; I am currently using your WP theme "Plainly", I really like the clean simple look of it. I am new at this, so if my question seems a bit of that of a simpleton, please bear with me. I tried to add the WP Calendar (widget) on the sidebar through the WP dashboard , but when I do, it knocks out all the sidebar components and only shows the "Calendar" period… nothing else? How can I keep all the sidebar features you have built in, and add a calendar? Thank you. By default in the theme, if you have any widget stuff, it completely replaces the sidebar. So you would have to add widgets for the Archives, Category list, Links, etc. However, you can edit the Sidebar page of the theme to add the widget stuff above or below the built-in sidebar stuff. Either move the first bit so that it’s directly above the "endif" (so that widget stuff goes at the bottom) or move the "endif" stuff so that it’s directly below the first bit (so that the widget stuff goes at the top). i’m looking for the exact theme like you, nod the green variante; have your actually templates? Sorry Roger, I’ve chosen not to make the exact theme of theblog.ca public, although it’s just a blend of Plainly and the default WordPress theme. There’s nothing fancy that you couldn’t reverse engineer in CSS, that’s for sure.